We acquire and manage assets because of the value they bring to our organisation, and we spend money and time maintaining and sustaining these assets to preserve their ability to deliver value. The ISO 55000 standard underlines the importance of the concept of value, and expects us to measure value in alignment with the strategic objectives of our organisation. Yet many companies struggle with how to define, measure and communicate value. Watch this webinar to gain insight from asset management experts on this topic. Please fill out this form to download the presentation slides. 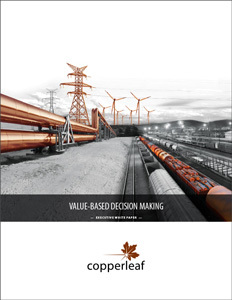 Download our executive white paper to learn how value-based decision making can help you fully assess the benefits of any project or investment, align decision making to your company’s evolving strategic objectives, and identify the optimal set of investments, alternatives, and timing that will deliver the greatest value while respecting all constraints.